I’m sure everyone is familiar with the school yard game of kickball. Kickball is played just like baseball but with a soccer ball. My version of kickball is slightly different from the standard way kickball is played. My version incorporates a lot of ball control. 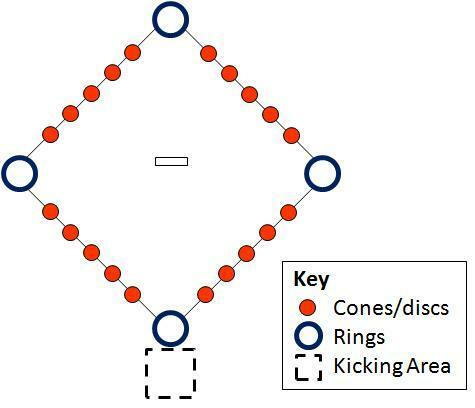 Set up the field as you would a regular baseball field (see graph below). The dimension should vary by age. Between each set of bases (i.e., home and first), set up discs or cones that the players will need to dribble through. Then number can vary. Each team gets 3 outs. An out can be registered by ‘catching’ the ball or forcing someone out at any of the four bases. After 4 balls (not 3 strikers) a batter is out. The pitcher is an offensive player. The pitcher kicks the ball over the home plate ring. A kick that does not go over the ring is called a ‘ball’. The pitcher is allowed only 4 ‘balls’ before the batter is out. The batter stands behind home plate and is only allowed to kick ‘strikes’. Once the ball is kicked, the pitcher must leave the field as not to interfere with the defense. The pitcher becomes the offensive team’s next kicker. Once a strike is kicked into play, the batter must take another ball (which is kept to the right of the batter’s box), and dribble between the cones to first base. Each cone must be successfully dribbled through. If the player misses a cone, she must return to the missed cone and continue dribbling. If the defensive team catches the ball or the ball arrives to first base before the batter, the batter is out. The same rule applies to any base. The batter can advance to as many bases as she pleases. However once a player commits to the next base, she is committed and can’t go back to the previous base. Each base has to be crossed before advancing to the next base. Players on base are allowed to advance as soon as the batter kicks the ball. To force a player out, the ball must arrive and be placed in the ring before the dribbling player arrives. Defenders may pass the ball to a player covering the base. Defensively, hands are not allowed except to ‘catch’ a ball. However, hands can only be used after a player uses her head, chest, thigh, or foot to control the ball before it hits the ground. Once the ball is controlled and before hitting the ground, the same player can catch the ball for an out. If the initial defensive player is not able to control the first-touch effectively, another defensive player can still ‘catch’ the ball as long as the ball does not hit the ground she first controls the ball with her head, chest, thigh, or foot. Offensive players are not allowed to advance or tag up on catches. However, if a ball is caught, players are permitted to dribble back to their starting base. A defensive player can force the runner out by returning the ball with a pass or dribble to the base the player must return to. That’s it. Equipment, field size, and rules can vary based on what works best for your team. Hopefully your team enjoys this game. The best thing of all, they are still working on their ball control and having fun doing it. This entry was posted on November 3, 2009 at 10:36 pm and is filed under fun practices. You can follow any responses to this entry through the RSS 2.0 feed. You can leave a response, or trackback from your own site.